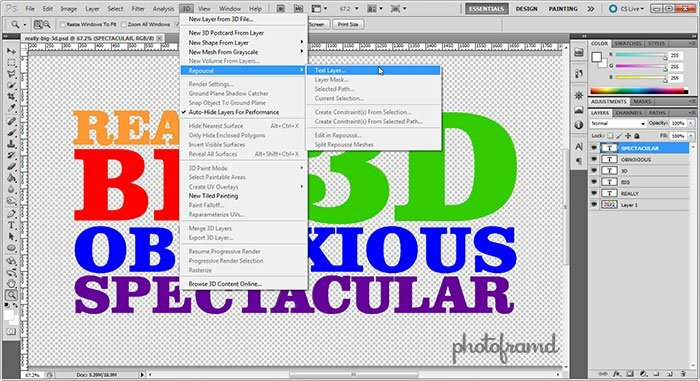 While the 3D capability added in Photoshop CS4 was functional, it was not very user-friendly. In fact, last year I stated that you were better off using Electric Rain’s Swift3D plugin for a true 3D creative environment. (My original 4-part series on Swift3D starts here.) 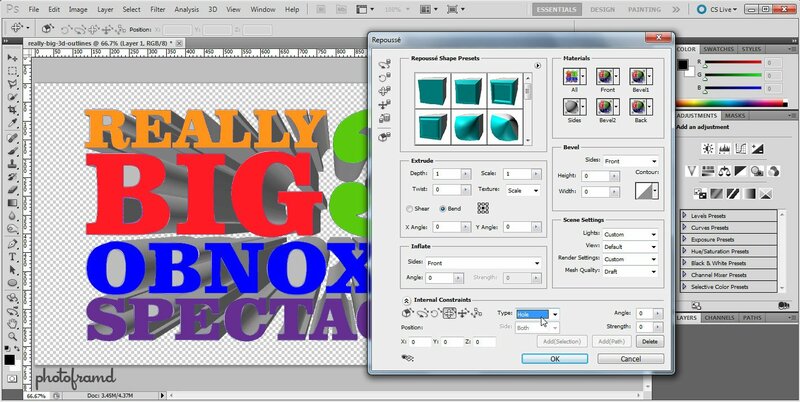 So, I was excited to hear about the new Repousse 3D feature added to Photoshop CS5 Extended. While it is an improvement, it still has a ways to go. 1. Repousse may work with Text, but not Illustrator Text. I tried importing the Illustrator file as a Smart Object and found the Repousse was not available. I even tried placing the file and it was still not available. After reading about Repousse on Adobe.com, I found that it will work with a Selection. So, I loaded the Layer as a selection and finally Repousse was available! Take a look at the above screen shot. First, Repousse did not pick-up any of the colors used in the Layer. It only used the selection path. And, even that was not handled very well. Look at the letters B, O, R and A. They are all filled in! I even tried Rasterizing the Illustrator Text first and loading that as a selection. However, it generated the same exact result. Time to start over. 2. 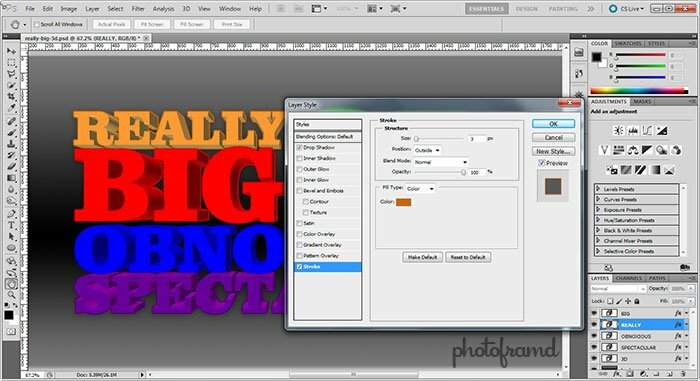 Recreate the layout using Text in Photoshop. I recreated the same layout with Text in Photoshop and finally Repousse found the Text Layer. 3. Repousse still rasterizes the Text Layer! Now, this is just silly! 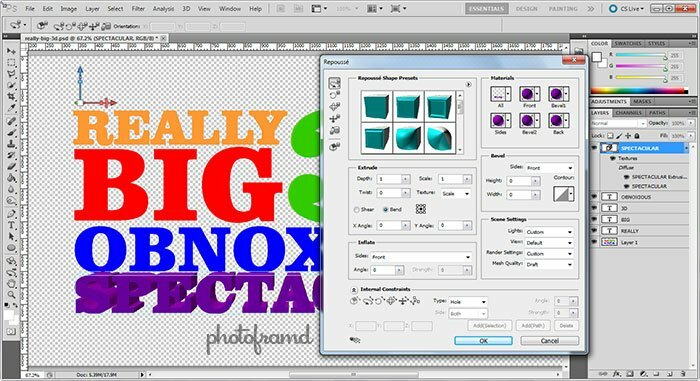 In order for Repousse to work with the Photoshop Text Layer, it needs to Rasterize the Text Layer first. 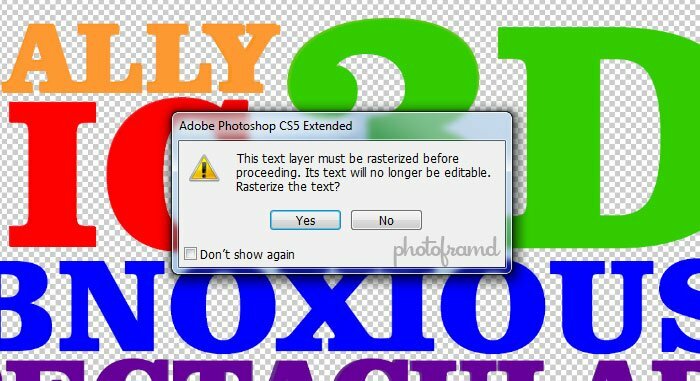 Adobe, please explain to me what is the difference between a Rasterized Layer of Photoshop Text and a Rasterized Layer of Illustrator Text??? Both should work! 4. Apply Repousse to the first Text Layer. At this point, I decided to just complete the demo. I applied the default settings to the first rasterized Text Layer. 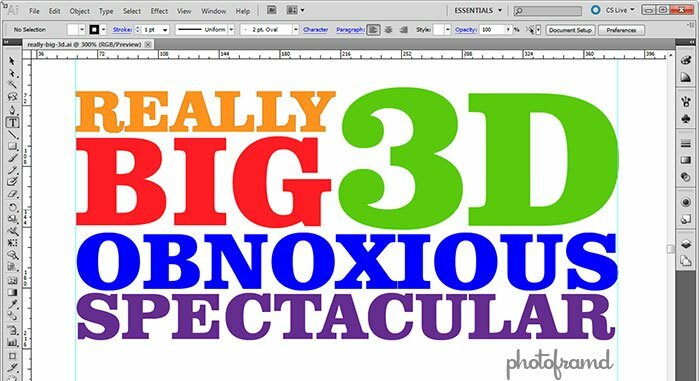 I was hoping that Photoshop would use the relative position of the text in the window to create the 3D perspective. Thankfully, it does. So, I could continue applying Repousse to each of the remaining Text Layers and they would match the first-person 3D perspective. 5. Once back in Photoshop, the Layer Blending Modes are fully functional. 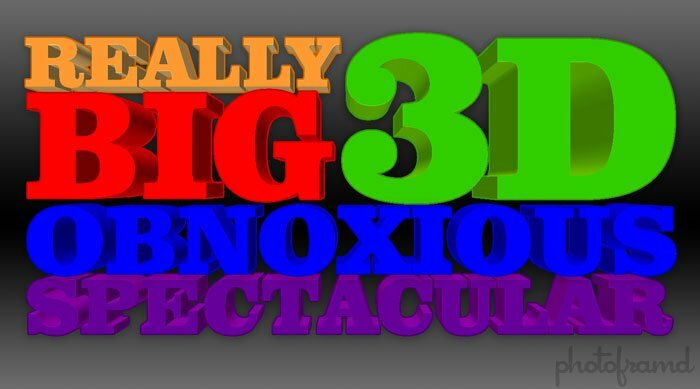 Back in Photoshop, I decided to make the 3D text pop a little more. I opened the Blending Mode and applied a stroke picking up a color slightly darker that the face color. This stroke was applied AROUND the 3D unit, not around each individual letter. I also added a slight drop shadow and again the shadow was applied around the entire 3D unit. I also rearranged the stacking order of the Layers to help complete the final 3D look. Repousse is an improvement over the 3D capabilities of CS4. However, it still needs refinement. I was planning on following this article with an update on Swift3D’s Photoshop plugin, but there is an issue there too. Although Electric Rain released a 64-bit plugin for CS5, it is buggy. In fact, the file that I created using the new plugin eventually crashed Photoshop CS5. It’s a shame because Swift3D’s interface is so much nicer than Repousse. It is a true 3D creation tool. I sent the file to Electronic Rain and am waiting for a response. I will keep you posted. NOTE: Electric Rain has fixed the 64-bit plugin for Photoshop CS5. See my newer article here. UPDATE! – UPDATE! – UPDATE! I decided to take another look at Repousse using the original Illustrator file. It turns out, you can take that file further. In the Repousse Panel, select any of the tools listed under Internal Constraints. With one of these tools selected, you can now hover over the filled in portions and see them respond with a dotted outline. Click the path to select it. Back in the Repousse Panel, under Internal Constraints, change the Type to Hole. The selected path will now be deleted from the filled solid. You now need to repeat this step individually will each of the remaining paths to finish the Holes. This process is time consuming. But, even more annoying is the fact the the 3D solid still does not pick-up the colors from the original Illustrator file. So, if you are looking to create a multicolor 3D solid, you are still better off recreating the file in Photoshop directly. Hopefully, this will change with future updates to Repousse. Next → Next post: Photoshop CS5 – Custom Keyboard Shortcut Reference Guide, Flash and Illustrator too. Yes, I am very disappointed in Electric Rain. I submitted my test file when I wrote the article so that they had proof of the bug and they have not responded with a fix or update. is that it is not showing up in the right hand side panels. I am planning a follow-up article on Swift3D PS in Photoshop CS5. It is far superior to the native 3D creation tools in CS5. HOW DO YOU load the Layer as a selection?? The easiest way to load a selection is to hold down Control + click on the Layer. (Command + click on Macs.) Otherwise, with the Layer selected, go to Select > Load Selection from the drop-down menu. 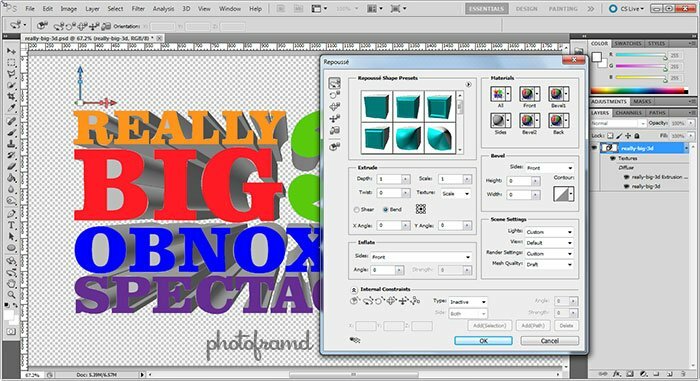 Electronic Rain has addressed the issues with the Swift3D plugin for 64-bit Photoshop CS5. It is now stable and works properly. See my new article https://photoframd.com/?p=3326. HI there. I have just installed the Photoshop CS5 to my PC to avail one of its new feaures esp the Repousse 3D. When I tried to use it, it is greyed out. Please email me if you have found the answers. 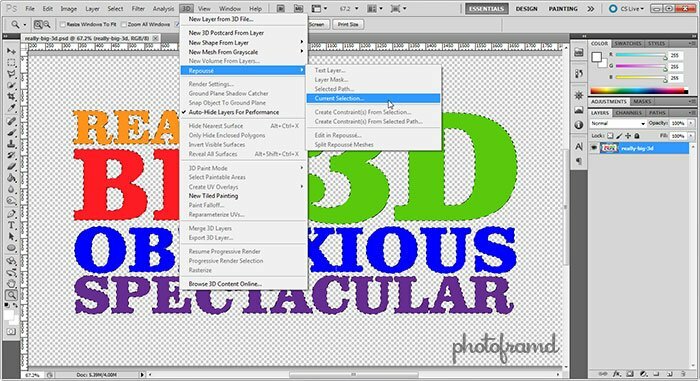 Are you using Photoshop CS5 Extended? Do you have a graphic card that supports OpenGL? If yes to both, try updating your graphic card drivers and check Photoshop’s preferences that OpenGL is checked. I have the same issue as melvic. I am using PS CS5 Extended. My graphics card is supported by CS5 and I have the latest driver. OpenGL drawing is enabled and is on advanced mode. OpenGL drawing on CS5 is working as I can use the rotate view tool, but all the subtitles under 3D are greyed out, such as Repousse. I have been searching the internet for a solution but I have found nothing. Some help would be greatly appreciated. Before you reinstall CS5, I would call Adobe directly. Repousse requires more than just OpenGL. Your graphic card must be capable of 3D rendering. Take a look at this list of Tested Video Cards & Known Issues on Adobe’s site. If your card is supported, then it sounds like you have some kind of conflict on your computer. You could also take a look at Electronic Rain’s Swift3D Plugin which is much better than Repousse. 3d model not open..how to fix this problem. i ming i click 3d and all is emty…repousse not click..
First, do you have Photoshop CS5 or Photoshop CS5 Extended? Only the Extended version has the 3D capabilities. You also need a good graphic card which supports OpenGL. Take a look at this list on Adobe’s site. If you have both Photoshop CS5 Extended and a supported graphic card, take a look at this FAQ on Adobe’s site from trouble shooting. You can also call Adobe direct; they are very helpful and support many languages. I get as far as the “Your 3D scene now exceeds the limit of lights and/or textures for the video card’s rendering” message. Once I click ok, I get another error stating that PS could not complete the program because of an error. I’ve considered pruchasing a new laptop with certain video card customizations to it. However to go this route would leave me without a computer for at least two weeks. I’ve read that external video card’s can be used via USB cord so we’ll see about that. In the meantime though, it is a real pain to have PS CS5 and not be able to take advantage of all of its capabilities. First, did you check for any updates to Photoshop CS5? There have been a few, one of which improved Repousse. Did you check your Photoshop settings? If your graphic card supports rendering, you need to be sure that it is enabled. If you do replace your graphic card, be sure to look at the nVidia Quadro series. Swift3D is still the better choice. 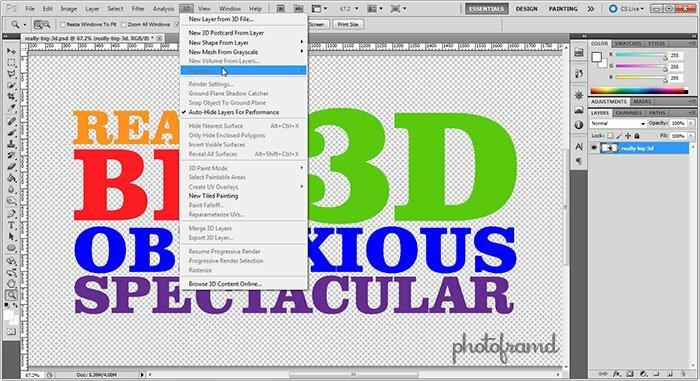 Version 6 fixes the previous problems and runs well as a Photoshop plugin. What kind or make of video card do I need for photoshop CS 5 repousse to work. It must be a graphic card which supports Shader Model 3.0 and OpenGL 2.0. The nVidia Quadro cards are well worth the money. They are great for 3D but even better for handling video in Premiere Pro & After Effects. hi, I do not know a lot about feet and I want to create 3D text effect, but I can not see the command repoussé, I’m trying to do what you wrote but still not advancing … and I can not speak English! you have any tips or I really have to find out about OpenGL? oh, another question, swift3d is good? I’m downloading a portable version and i wish know… thanks for everything! First, do you have Photoshop CS5 or Photoshop CS5 Extended? Only the Extended version has Repousse. Next you need to check that Open GL is enabled. Take a look at this quick YouTube video. There is also info direct from Adobe here. Swift3D is much better than Repousse! It is currently in its 6th version and it is very polished. It is available as both a plugin to Photoshop CS5 and as a standalone program. There are also several tutorial & videos available from Erain. Thank you thank you thank you! Your little update at the end was the answer I’ve been looking for all night! How to remove more than one hole, simple once you know how!